The Five Points MARTA Station Makeover project is an effort led by Central Atlanta Progress and the Atlanta Downtown Improvement District to evaluate, design and execute creative place making enhancements for Atlanta’s South central business district’s MARTA rail stations, specifically the Five Points station. After a comprehensive research and outreach process, results from the station assessments, surveys, and intercept feedback were synthesized to devise five guiding principles to support MARTA’s overall goal of increasing ridership. The majority of the methods focus on near-term, community based improvements, most of which could be completed with a modest schedule and budget. Wayfinding Signage: New signage utilizing the universal icon for transit and branded with MARTA colors was installed atop the Five Points Station façade to serve as a beacon to the public. Food Trucks: CAP/ADID hosted Food Truck Fridays – a weekly lunch time presentation of food trucks and live music on Broad Street Plaza. The event’s immediate popularity attracted hundreds of new visitors and food vendors the plaza space each week. The event has since moved to Woodruff Park. Station Soccer: Soccer in the Streets and the Atlanta United Foundation opened the world’s first soccer field at a transit station, garnering noticeable media attention. Because of the new station activity, the area is frequently populated and lively during hours which were previously sparse, a station soccer league has formed, one that consequently provides easy access for all Atlanta area soccer players willing to hop on the train and ride to Five Points Station. Community Garden: The Five Points Farm opened in the fall of 2016 with much interest from the Downtown community, prompting a wait list, and continues to thrive thanks to an active community of gardeners. Station Area Art: In November 2016 CAP/ADID commissioned a local knitting group to knit large colorful sleeves or “socks” to adorn the mature trees around the station. To create a social media buzz, accompanying yard signs with witty taglines promoted the “Knit Show on Broad St” hashtag. 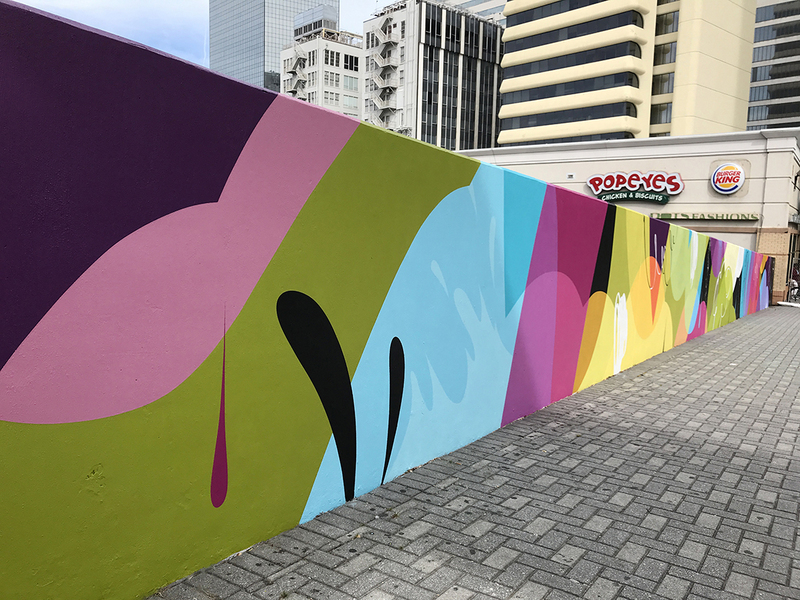 In late 2017, artist Ryan Coleman was selected to paint a 600-foot long mural on a blank station wall. "Don't Forget To Dream" adds a needed splash of color and activity to the plaza. Broad Street Plaza Lighting: Purposefully placed string lighting reversed the plaza’s negative perception, brightened the area, and introduced a whimsical appearance for day and nighttime audiences. For additional project information and details please contact Wesley Brown at wbrown at atlantadowntown.com or 404-658-5983.